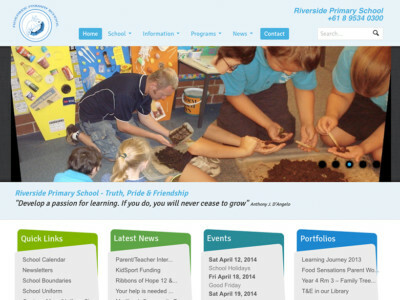 School websites that go beyond the ordinary. Choose a pre-designed theme and get it customised for your school, or commission a custom design. Use image galleries to show school events (sports, drama) and student work. Offer services, products and gift vouchers for sale online. Accept credit cards, integrate with your accounting and POS system. Communicate with parents in the way they are most comfortable - let them read their email on their computer, iPad or iPhone. Use enquiry forms to automate key school functions such as providing event permissions, scheduling parent/teacher interviews, and registering/confirming event attendance. Display the school calendar online, including key term dates, sports events, P&C meetings, board meetings and special events. Enable parent calendar subscriptions using iCal. Operate your school website from a mobile phone, tablet or large format desktop computer. Responsive design enables content to adapt to large/small formats. Use the WordPress dashboard to update all of your website content including pages, posts, images, events and products.